The FurWonder is an electric grooming brush for combing and detangling a dog's coat. 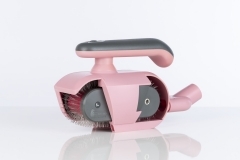 It consists of a basic unit (available in the colours pink, mint and golden yellow) with a motor drive and a brush cartridge. It can be easily changed as needed for different applications or coat types, so you can also massage your dog with an additional cartridge, for example. The brush speed is adjustable. If the brush belt gets stuck due to badly knotted coat, the safety electronics stop the motor automatically. Hair and dirt particles can be easily removed or vaccumed off using the enclosed comb or a vacuum cleaner. You can find details about the function and handling of the brush on our homepage furwonder.com. Please let us know via info@furwonder.com if you are unsure which brush cartridge is most suitable for your dog. We will be happy to advise you.